LOFOTEN was the fourth Hurtigruten ship with the funnel aft. RAGNVALD JARL (1956),FINNMARKEN (1956) and HARALD JARL (1960). Everybody liked the style. 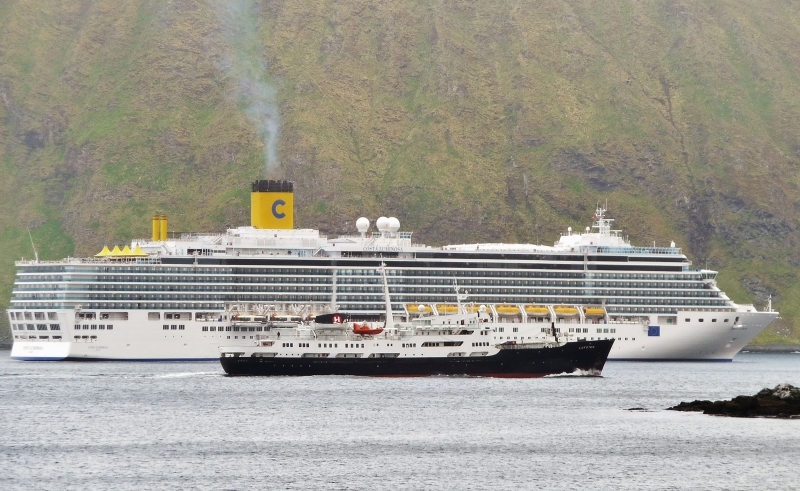 In my opinion, these Costa ships with their straight-up-and-down funnels are rather good lookers and I would not condemn them as ugly just because they are modern. In fact, I do not think that the LOFOTEN, with its squat, too-far-aft funnel, is particularly handsome. Both, though, are no doubt well designed for their respective roles. Aesthetics are always a matter of "in the eye of the beholder". quite the contrast of the shipshape and not so much big guy! mr.dot. This photo has been shown 747 times since it was added to the site.